I want to begin by wishing my dear friend Annette (Voodoo Vixen) a very happy birthday. Next, I want to apologize for being offline. Due to circumstances beyond my control, I have scheduled a few posts, but will not be around to link them. Please forgive me, because I don't like to be gone, and like it even less when I can't visit and leave comments. Now back to the scheduled post. Once again I'm joining Erika at Bio Art Gal this month's host at Art Journal Journey with her theme New Year, New Adventures. I'm also joining Moo Mania & More with their theme Welcome Somebody / Something / The New Year. Whether we choose to admit it or not, we all have baggage. Words we wish we hadn't spoken, actions we wished we had never taken, relationships/friendships that ended in disaster. then head for a new adventure to parts unknown. For this page, I began scraping paint onto my Challenges altered book using a faux credit card. I intentionally left a few parts unpainted, then grabbed one of my new stencils and added the circles that have ridges around them. Next, I added several large circles using a metallic and a white Gelly Roll pen. 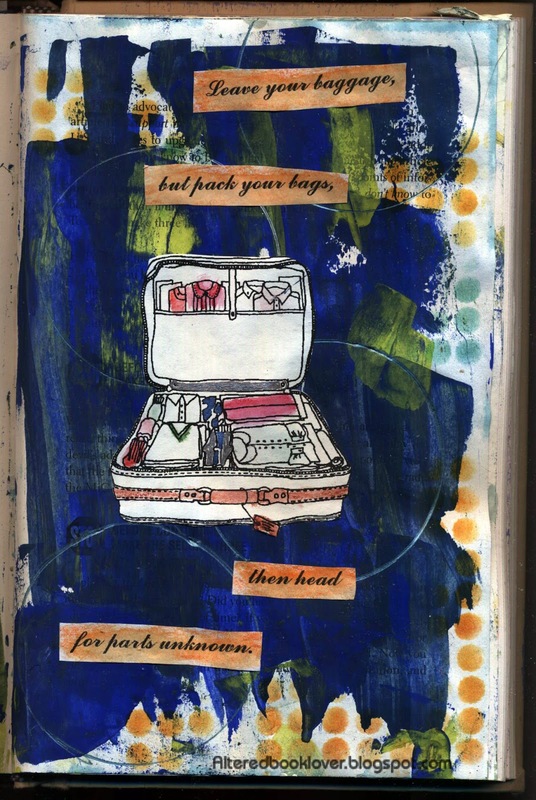 The computer generated text, "Leave your baggage, but pack your bags, then head for parts unknown" was colored using watercolor (water soluble) crayons. I used both watercolor crayons and metallic pens to color the bag and its contents. Thanks for joining me today at Art Journal Journey. And thanks for your visit and continued support of my art. I am very grateful to each of you. The idea for this page is fantastic and I really love how you created it Elizabeth! Thanks a lot for joining not just AJJ but also Moo Mania & More with this brilliant entry my friend! I would like to pack my bags and go someplace really warm! Great idea and I hope whatever you're doing, you are having fun! Its a fabulous idea for the page. I like the thought of packing a bag and getting away. Hope you are well and somewhere where you enjoy being. Just saw your question. X Files is on Fox Wednesday nights at 8. A fab and arty page Elizabeth! I love it!!! This page is awesome. And perfect for the beginning of the New Year. Love the blue background. 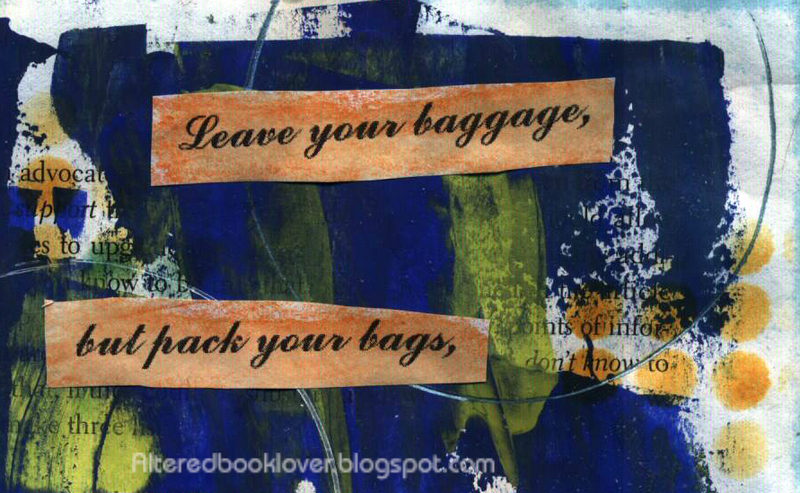 I love "leave your baggage" and will try to look forward not back as I head into the unknown of this new year. I like the look of your background. 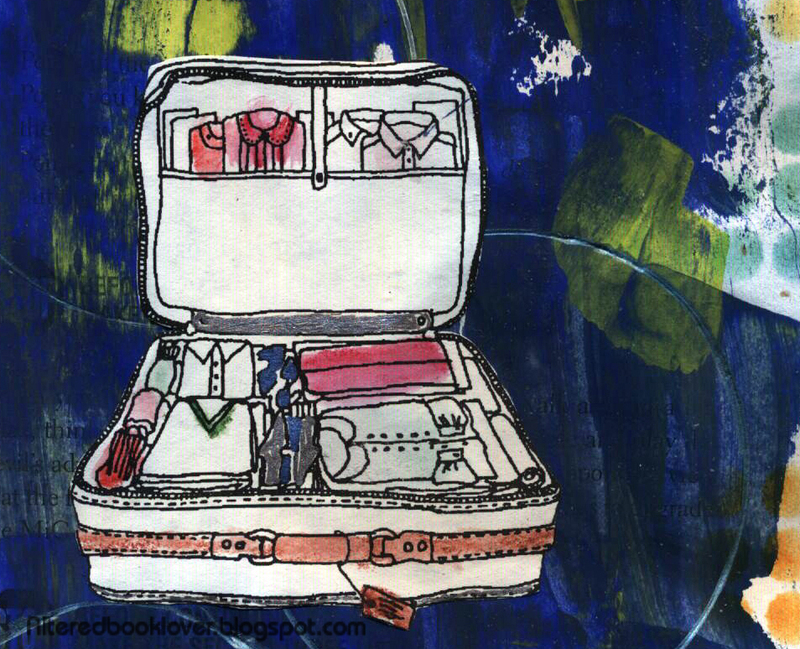 I love anything with a suitcase in it!!!!!! Very cool. What a fantastique page Elizabeth !! Love love it !! The colours are fabulous and the quote so cute ! Wonderful!! I like very much every Art you create!! Wonderful page Elizabeth. Great concept. This is great! Thanks you for explaining how you did it. I am so glad I have subscribed by email to your blog! I will learn how to do a altered journal. I love mixed media and have most of the tools, just not the knowledge how to use it all! Hope everything is ok with you. Gorgeous page and the statement is VERY true! Happy new year!